The information gathered in this form is only used to send you the CFI newsletter. The information may be kept for no more than 3 years. In accordance with the Data Protection Act of 6 January 1978 amended in 2004, you have the right to access and correct information relating to you, which you can exercise via the contact form or by emailing webmaster@cfi.fr or writing to François Xavier Raffin, CFI, Direction générale, 62 rue Camille Desmoulins - F - 92130 Issy-les-Moulineaux. 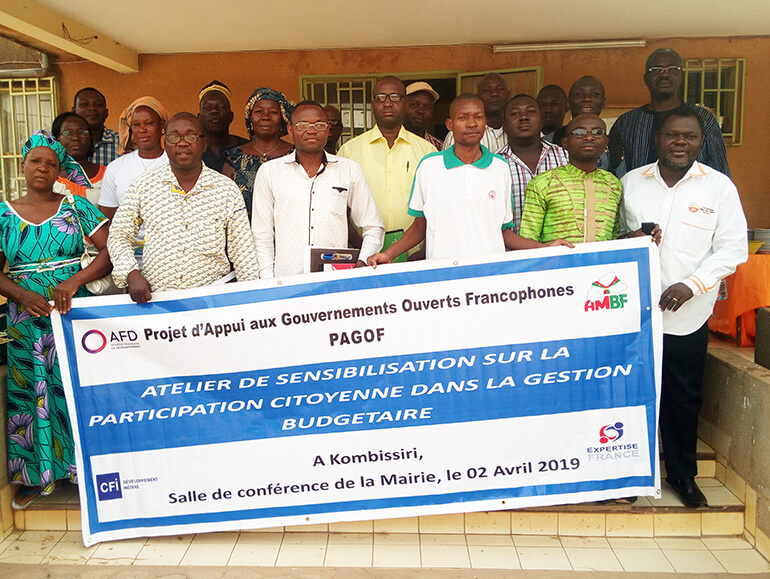 From 25 March to 2 April 2019, five communes (municipalities) benefited from workshops to raise awareness of citizen involvement in commune budget management, organised in conjunction with the Burkina Faso Association of Municipalities (AMBF). The aim of the project is to get citizens involved in developing the budget for their commune, but also in monitoring and examining the results of budget implementation. Over one day, elected officials, civil society organisations and local media outlets from the communes of Bobo Dioulasso, Sabou, Réo, Tenkodogo and Kombissiri reflected on how to improve citizen involvement in commune budget management. Participants' understanding and knowledge of the principles of the budget process and participatory budgeting were boosted. They learnt what role active citizens and civil society can play in the various steps of the budgeting cycle, particularly by means of simple and practical tools to facilitate involvement. These awareness-raising sessions form part of the activities of the #PAGOF project (Project in Support of Open Governments in French-speaking Africa), which supports the technical implementation of the commitments made by each country as part of their National Action Plan. More specifically, the aim of these activities is to support the fulfilment of commitment 13 of the 1st Burkina Faso National Action Plan:to organise Community Dialogue and Question Forums relating to commune budget management. The aim of these forums is to increase transparency in commune management, enabling community accountability. They are also intended to better inform citizens on the local budget and its implementation. Thanks to these initiatives, the management, accountability and transparency of these communes will be improved, which will reinforce the relationship of trust between the communes and their citizens.